'Let It Be' is a new West End jukebox musical featuring the colossal back catalogue of The Beatles’ hits. Celebrating the 50th Anniversary of the world’s most successful rock’n'roll band, the show takes you through from their first album 'Please Please Me' in 1963, right up until 'Let It Be' in 1970. The West End is no stranger to musical theatre which capitalises on the success of popular music/musicians. 'We Will Rock You', 'Mamma Mia!' and 'The Jersey Boys' have all proved to be very lucrative ventures and the forthcoming Spice Girls musical, 'Viva Forever', is already looking to be another money-spinner for the London theatre district. It’s surprising that it’s taken so long to capitalise on the Fab Four’s success, especially seeing as they’ve easily surpassed every other musical act to become one of the biggest bands in the world. Their albums continue to sell steadily to this day, with 'Sgt Pepper's Lonely Hearts Club Band' album being one of only three albums ever to have sold over five million copies. In comparison with other West End musicals, 'Let It Be' has much less emphasis on theatre and much more focus on the uncannily accurate musical performance of the four Beatles impersonators. There’s no plot, bar a chronological set of performances from 'Love Me Do' to 'Let It Be' with a minimal amount of talking in between songs. The four Beatles most definitely sound the part, and they’re all incredibly accomplished singers and musicians who seem to really know and love the music they’re playing. Both the performers playing John and Paul are able to switch effortlessly between the various guitars and piano making it a superbly fastidious tribute to the famous musical icons. They also look the part, dressed up in a whole host of iconic Beatles costumes, from the famous Sergeant Pepper uniforms to the bare foot Abbey Road seventies clothes seen on the legendary album cover. They even change their wigs and fake facial to authentically portray their changing looks of the band through the sixties and seventies. But generally the standout feature of the show (apart from the music obviously) is the wildly inventive staging. Without a storyline, the backdrops have to do a lot of the work as the musicians recreate the Fab Four’s most noted gigs. The multimedia rich sets imitate everything from The Cavern Club to the Royal Variety Show performance – the one where John Lennon famously asked the audience to rattle their jewellery instead of clapping. They play the famous 1965 concert at Shea Stadium, where over 55,000 screaming girls packed in to see them play at the height of Beatlemania and they take a psychedelic LSD-tinged trip through the Magical Mystery Tour. There are giant TV screens on the sides of the stage which show various projections and short film sequences, each representing the specific mood and musical period. There are Terry Gillam-esque Monty Python animations, 'Yellow Submarine' cartoons, but a particular highlight was 'Lucy In The Sky With Diamonds', which incorporated 3D light projections that magically filled the Prince of Wales Theatre with whole host of tiny stars. 'Let It Be' recreates the experience the experience of seeing 'The Beatles' live for anyone who didn’t get to the first time round (which is a substantial number of people as the band apparently stopped performing in 1966). There’s a complete mix of ages, from grandparents to grandchildren, but everyone is enthusiastic and eager to get up on their feet, sing-along and dance to their favourite tracks. For those that don’t fancy watching a Beatles tribute act run through their back catalogue, certainly give it a miss, but for those interested in a night of fantastic set pieces and wonderful music that provided the soundtrack to a decade, 'Let It Be' won’t disappoint. 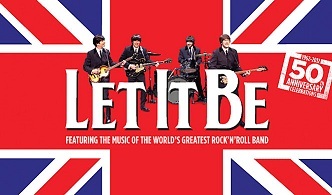 'Let It Be' is at the Prince of Wales Theatre, London, W1, booking until 19th January 2013. Find more info at letitbelondon.com.